This is the North Eastern edge of Pluto where a series of expansion fractures have created a feature referred to as a spider. It seems the land ice is under stress from below and has relieved that stress by creating long vertical fractures along with short horizontal cracks which merge into this central zone called the spider. The fractures running south turn westward through the uplands/wetlands and eventually connects with Sputnik Planitia. This Sleipnir Fossa crack eventually wraps from the north eastern side of Pluto southward into the wetlands migrating west into Sputnik Planitia traveling northwest through SP finally connecting to Inanna and Dumuzi Fossa traveling through the dried basin Piri Planitia and joining with a long vertical crack called Djanggawul Fossae. More detail on page 28. In the below image I have used a blue line to draw from the Spiders fractures how these cracks connect from one side of Pluto to the other. I can't see under the fluid at SP but I can see where large fractures exit the western and eastern sides of SP. I have connected the two sides of SP where these fractures enter and/or exit the basin. Same image no lines. 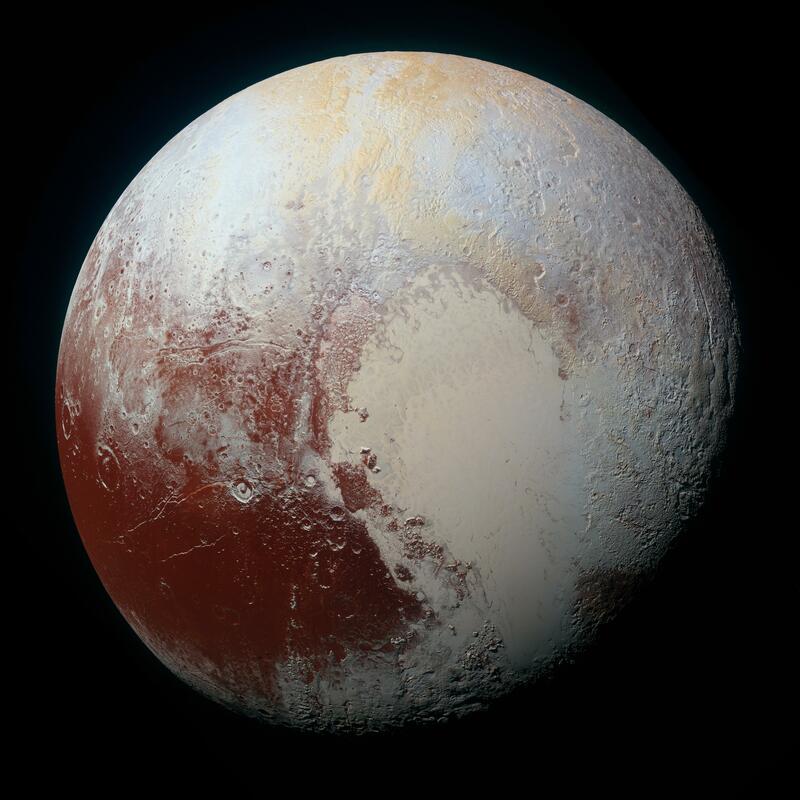 If you want to trace these fracture lines for your self it helps to use a hi res image of Pluto like this one and this one. Or you can just trust me but I suggest you don't trust me, see it for yourself. Initially, I thought this was a map of the fractures under the nitrogen flow at SP but after paying closer attention to what NASA actually said, this is instead a map of the surface with its many cellular mounds with the trough patterns outlined in black lines. Image credit: NASA / Johns Hopkins University Applied Physics Laboratory / Southwest Research Institute. Seeing NASA's image above I initially concluded the surface trough patterns were displaying the subsurface fractures in the crust below. But NASA described these features as convection cells and this conflicted fundamentally with my concept so for 16 months I have struggled with what these features really are. NASA describes these as convection cells behaving something like lava lamps. If they are convection cells then my theory about these troughs reflecting subsurface cracks is wrong. If they are not convection cells then my theory about them may have some validity to it. One fairly obvious observation is the cellular patterns are mostly larger nearer to the center of SP and are smaller nearer to the edges. They then fade into a flattened surface without troughs but with a higher density of sublimation cups. Shallow sections of SP (nearer to land ice) tend to be devoid of troughs (not always) but have an increased quantity of sublimation cups. Medium depth areas produce small cellular mounds bounded by troughs. Deeper areas (farthest away from land ice) create large cellular mounds bounded by troughs with fewer sub cups. The sublimation cups tend to decrease in size and quantity the further away they are from trough lines. If the surface trough's mimic fractures below then I can connect one side of SP to the other where large fractures enter the basin but I'm really questioning this concept. NASA's map below shows cracks leading into SP from both the NW and the SE (red lines with X's). If these polygonal cells are created by convection then the surface patterns are totally random if they are a reflection of subsurface cracks then their pattern may tell a story. One could literally draw just about any series of connecting lines on that NASA map and produce any shape desired so this is not very clear evidence of anything but put it together with other information and it may actually help tell an accurate story. This is the north eastern side of Sputnik Planitia. I drew yellow lines over the visible fractures in the land ice and then drew red lines over the troughs and red tholin swirls in the nitrogen liquid. Bottom line for me is that I am confused by the surface of SP. I've tried to see patterns in it that would explain its processes but after a year and a half I am still baffled by its surface. Lets break it down, perhaps this will lead to a conclusion. These are the general observations I have. Near some of SP edges the cellular mounds bounded by troughs dissipate into flatter surfaces (troughs disappear). These flatter (troughless) areas tend to have a relatively even distribution of sublimation cups. Generally speaking the troughs form smaller cells closer to shore than nearer to the central area. Cells with sublimation cups tend to have the largest number of sub cups near the trough's that line the cell. The red tholin oil slick material tends to thicken in the troughs in some areas but is missing from troughs in other areas. In fact sometimes you can use the tholin to identify the troughs while other times you must use the absence of tholin to identify the troughs. The polygonal cells are anything but regular making it somewhat incorrect to call them cells or polygonal. The cell's troughs abruptly stop or start for no obvious reason. They are often unbounded for vast distances. They are not consistent in any type of shape except smaller ones tend to form around the edge while larger more loosely defined ones form away from lands edge. Some sublimation cups seem to expose land ice heavily covered in red tholin from below the surface similar to how surface tension on earth causes water to have sharp drop off edges. Where the wetlands flow into SP the collapsed land follows the same rounded lines and merge into troughs that appear to form the cells. Iceberg peaks tend to poke up within a trough so either the raised land peak is shaping the troughs or the icebergs are floating along the troughs. Along the SSE edge where fluid flows into SP raised land peaks appear to form the troughs This makes me think most of these "icebergs" are not actually floating but are protruding up from and are attached to a subsurface bedrock. The center of the mounds are higher than the edges and show less signs of sublimation cups suggesting they are also colder in the middle and warmer at the edges. This warmth near the troughs creates a more aggressive sublimation process creating more dimples as the gasses are evaporated. This below image makes me think the land ice is just below the surface creating the troughs which define the cells. You can clearly see how the uplands/wetlands are raised, the fluid flows into SP off the wetlands, erosional processes appear to have collapsed the elevated upland down into SP, bits of peaks shaped by the fluid's flow peek above the surface in cellular patterns which follow directly in line with the troughs. The deeper we travel into SP, the peaks become less defined but still follow the trough lines or should I say the trough's follow the line of the peaks. I mean, I don't really know if these iceberg peaks are floating or if they are attached to subsurface bedrock in turn defining and shaping the troughs on the surface of SP. This image makes me think the terrain's peaks are causing the troughs to be formed somehow. Its fairly clear that the right most land is attached as it migrates further out it sinks only allowing the highest peaks to peek through the surface of the nitrogen ocean then they finally drop too far below the surface to be seen but their trough effect is still seen. This makes me question the whole lava lamp convection cell concept. In this paper called The surface age of Sputnik Planum, Pluto, must be less than 10 million years, David Trilling indicates there are three mechanism by which the surface of SP could be getting turned over on a time scale of less than 10 million years. The surface material flows to relieve any topographic features and horizontal and vertical stresses. (perhaps partial) melting of nitrogen ice. This liquid material, which is under pressure, could be extruded to the surface through local cracks (presumably the same cell boundaries described above) and fill in any negative topography before freezing. This mechanism requires that the temperature at the base of the SP surface layer be around 63 K, at which temperature solid nitrogen melts, compared to the surface temperature of 38 K.
Viscous relaxation does not account for the surface topography with the troughs creating cell boundaries. Convective overturn is the description NASA seems to favor but I struggle with this one and I'll explain why shortly. Cryovolcanism seems to fit what I see more than any other description. First I'll explain why viscous relaxation does not seem to accurately portray what is seen. Certainly there must be some form of viscous relaxation taking place in order for objects to impact the surface then disappear sorta like quick sand swallowing an object except in this case it's more like slow sand or as Alan Stern describes it the nitrogen ocean has a toothpaste consistency. In this image you can see how there are troughs creating cells. To suggest that viscous relaxation is the cause of this surface is to ignore these troughs. Some process is creating them. If you look close at this image one thing that seems to be taking place regularly is the more aggressive looking sublimation cups seem to cluster around the troughs. while further away from the troughs the sublimation cups tend to lighten up significantly. The more sublimation taking place the more likely it is these areas are warmer than the areas with less sublimation cups. Central parts of the cells are not smooth but the sublimation process appears to be significantly subdued compared to the zones around the troughs. Sometimes an area without a clearly defined trough will have aggressive sublimation pits which seem to be turning into a trough but not quite there yet. Sometimes the heat that makes the sublimation pits is strong enough such that the surface near the most aggressive pit formation becomes completely smoothed over. In other words, the fluid is so warm it can't even retain the shape of the sub cup. Areas with more pits tend to line up near areas where troughs exist or seem to be about to form. It seems as though the aggressive action of the pits precede the formation of the troughs. This suggest heat is welling up at these "More pits" spots which in turn forms the troughs. In other words, the troughs are the byproduct of their alignment with a source of heat from below indicated by the sublimation cup's size and quantity. Take a look at this below image where an X is forming. The section just below the X looks like it is actively bubbling with heat such that the surface is mostly smooth with large inverted bubbles or sublimation cups. Large quantity and large sized pits equal more aggressive bubbling or a hotter zone. The upper left arm of the X is forming a trough connection (green text arrows) with the long diagonal trough. Lots of cups line the edges of the troughs while conversely fewer and smaller in size cup's exist further away from the troughs. Fewer smaller cups indicate colder less active zones. These drawings are notes from James Keane describing NASA's favored convection cell concept. In the notes taken from Peter Buhler (below right) you can see a chart showing how the sublimation cups grow larger and more numerous near the edges or troughs of the "convection cells" even though this is a really good observation by Buhler, calling these features convection cells is misleading. I'm going to show you why it doesn't make sense to call these features convection cells. Notice in all these drawings the message conveyed is that the heat rises to the middle of the cell, fans out, cools then drops back down along the trough but that is not what we observe, that is, if you look closely with open eyes at the surface of SP. These James Keane's notes from various science conferences span about 6 months. They are describing the favored version of NASA scientists explanation (convection cells) for the cellular/polygonal mounds bounded by troughs in Sputnik Planitia. Images like these and concepts like convective overturn really blocked my mind from expanding beyond this concept. Its a concept that seems to make sense but does it really hold up to observation? What kept bugging me was how the convection concept is the hottest part of the cell has to be in the center. That warm fluid rises then cools as the material migrates to the outer edges where we encounter the troughs. The cooler fluid is then supposed to fall back down at these boundary troughs to be heated then rise up at the center of the cells. The natural conclusion then is that the middle of the mound is more heated than the edges and thus more elevated it all seems to fit if you really don't look at the scene too closely. The problem is, the larger sublimation pits (more aggressive bubbling) both in quantity and size exist near the troughs indicating the troughs are warmer than the central area of the cells. Warmer areas will sublimate (evaporate) away the surface ice faster than colder areas. This indicates the heat is welling up where the troughs form. Which in turn fits more nicely with the last NASA concept of cryovolcanism which is not their favored concept but is mine. Cryovolcanism combined with viscous relaxation better describes what we actually observe than convection. Let me paste that cryovolcanism description here so you can read it again. The assumption here is that at the base of the SP surface layer, which we again take to be on the order of 10 km, there is (perhaps partial) melting of nitrogen ice. This liquid material, which is under pressure, could be extruded to the surface through local cracks (presumably the same cell boundaries described above) and fill in any negative topography before freezing. This mechanism requires that the temperature at the base of the SP surface layer be around 63 K, at which temperature solid nitrogen melts, compared to the surface temperature of 38 K.
This works on a couple levels for me. There is a subsurface heat source, Increased pressure could cause the nitrogen to melt. This melted warm nitrogen would rise and extrude through cracks creating the cell boundaries at the troughs. This then would also allow the subsurface cracks oozing warm nitrogen to be roughly mirrored by the troughs on the surface. Below is Enceladus of Saturn with its fractures around the south pole aka tiger stripes. Internal heat is released from these Tiger Stripe cracks. The heat at these cracks cause a zipper looking effect as the ejected water spews out and freezes into mounds lining both sides of the crack. Enceladus orbits Saturn every 33 hours while Dione orbits exactly twice that. This puts Enceladus and Dione in an orbital resonance. Which causes extreme tidal flexing on the interior rock of Enceladus as well as the ice crust. The tidal flexing creates heat which separated out the rocky material from the icy (watery) material. The heavier rock drops to the center creating a core where volcanic vents developed. That heat is released through the Tiger Stripe cracks. These cracks are the hottest place on Enceladus. When they are stretched open the subsurface water ejects into space creating the outer E ring of Saturn. While water must be heated to much higher temperatures on Enceladus to be a liquid, on Triton a moon of Neptune not as much heat energy is required to perform a similar function. Triton is not aligned with Neptune's equator so it is also tidally stretched as it tries to settle into alignment with Neptune's equatorial zone. This amount of energy has been enough to make its surface young as the nitrogen skin apparently heated close to 66 K. Triton's skin fractured allowing nitrogen to rise and spill out into long zipper like cracks similar to but at significant temperature differences to Enceladus. This seems to be a consistent effect of a solid cold surface near to and in contact with it's fluid counterpart. Many but not all of the troughs on the surface of SP show signs of this zipper like crack feature further suggesting heat is welling up at the trough zone. Rather than heat rising at the center of the cell working its way to the outside cooling and falling back to the floor, heat appears to rise at the trough line. As the frozen surface cracks open the fluid below is rapidly cooled hardened into the shape of the troughs. The troughs are the warmest area and the center of the cells are colder. This is exactly opposite what the convection theory purports. Notice how the cracks in these two images have that zipper look. Because I adopted NASA's terminology (convection cell) to describe these patterns, its been extremely difficult for me to see these cellular mounds for what they actually are. They are not convection cells else the hottest part would be in the center (with larger sized and quantity sublimation cups) and the coolest part would be at the boundaries (small sub cups). Since the warmest part is obviously along the troughs these are then created by cryovolcanism. The cracks in the subsurface crust are seeping hotter (66 degrees Kelvin) fluids of nitrogen from below creating the larger (quantity and size) sublimation cups at the surface in turn creating channels or troughs that actually do mimic the subterrain's fractured floor. I think this process is similar to regelation. Regelation is the process by which a substance melts under pressure and refreezes after the pressure is released. Increased pressure decreases the melting point of ice and I assume the same holds true for nitrogen. If the fluid nitrogen at SP is 10 km thick, it will create an increased pressure on the bottom layer of nitrogen. At depth the nitrogen would also be insulated further encouraging it to liquefy. Combine that with any available heat energy and since liquid nitrogen is less dense than frozen nitrogen (opposite to water) it would seek to rise to the surface in turn creating sublimation cups and cracks aka troughs. It is March 25th 2017 and it has taken me till now (16 months) to be fully convinced of this fact. The hottest part of these cellular or polygonal mounds is along the channels not the center of the cells meaning convection is out, some mechanism similar to cryovolcanism is in. NASA had 3 options to choose from, it seems to me, they got it wrong with convection cells. Another important fact here is that the temperature for nitrogen to turn liquid is only 66 degrees Kelvin (-207 C or -341 F) (less with increased pressure) meaning there is no liquid water. Water can't be liquid at that temperature, only nitrogen. Just because nitrogen can form into a liquid at SP doesn't mean water ice can liquefy at these extreme temperatures. If you mix ammonia with water ice it can be a slushy liquid down to about 176 degrees Kelvin (- 97 C or - 143 F) so there is quite a long way to go from liquid nitrogen at 66 K to liquid water/ammonia at 176 K.
This is NASA's convection cell theory. The mounded middle of the cells support this theory but the observation of hotter troughs do not. These cracks running across much of Pluto seem to also be reflected in the surface nitrogen terrain of SP through cryovolcanism processes. The cracks at the Spider are expansion fractures and there is a cryovolcano at the mouth of the Spider. Running south of the spider into Tartarus Dorsa the land surrounding the cracks is expanded bulging outward creating expansion fractures (subsurface pressure). The cracks running through SP seem to have formed under collapsing conditions then as we migrate out of SP to the west the cracks are once again expansion fractures. Above and below the area called Viking Terra are a set of cracks running horizontal. Viking Terra is a bulge in the land as subsurface pressure have distended it creating the fractures. This seems to imply that either the land needed to bulge outward to accommodate the collapse of SP or SP collapsed as a consequence of the land bulging outward to the east and west. I think the more likely of these two scenarios is that the one event of Sputnik Planitia's collapse caused the land on either side to bulge upward fracturing the land ice. This page really cracks me up.